How can I enable actions telnet - ssh in PRTG network monitor - Device Context Menu (Device Tools) to allow access in Linux servers and routers cisco, through the command line interface on the Putty and KITTY applications? Access to devices using Telnet - ssh protocols, can run making the integration of PRTG network monitor with KITTY application. The function (Telnet, SSH) in PRTG can facilitate the work of network administrators, allowing direct access to Linux servers, Cisco switches and routers, through CLI command line interface using the Kitty application. 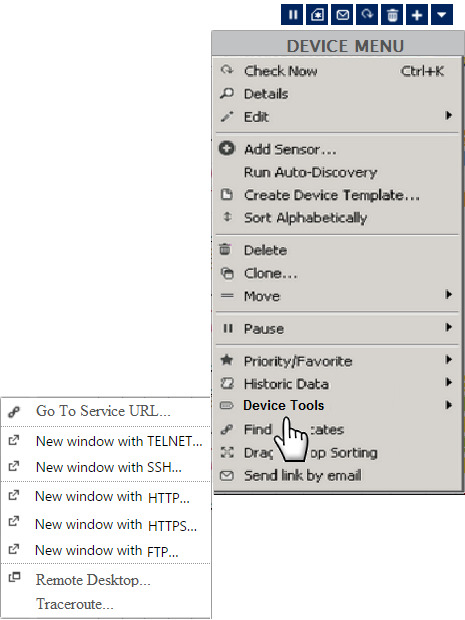 Device Context Menu - Device Tools with action (TELNET - SSH). The original code in black must be changed and become like the bold code. Add the code in Bold between the original code in black. 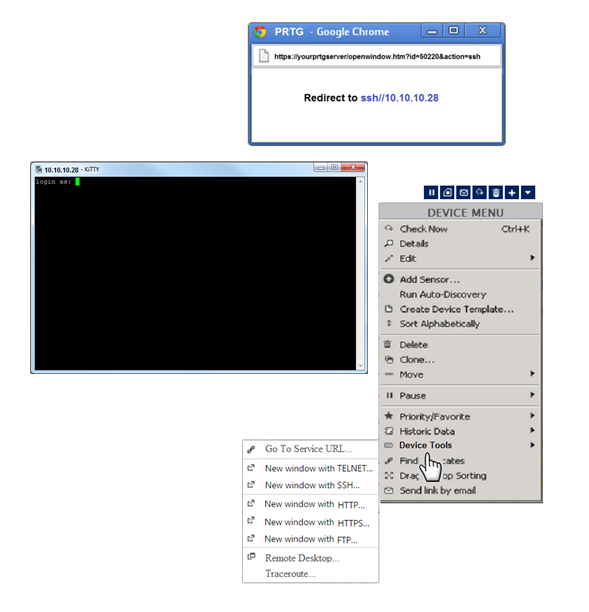 New window with TELNET... Open a new browser window with action (TELNET) and redirect for IP address of the device in application KITTY to make the connection. New window with SSH... Open a new browser window with action (SSH) and redirect for IP address of the device in application KITTY to make the connection. Create KiTTY folder in the path (C: \ Program Files) and add the executable kitty.exe program. Download and run the file (kitty_ssh_handler.reg) to update the Windows registry with the environment variables Kitty.exe. After following the steps above you can access HTML pages with links (telnet: and ssh: ) connection running these protocols. Can you help me on this item ? Sorry, but this is no longer supported. You can try doing this PRTG integration with VNC using a VNC WEB access version. Hi am using PRTG v18.2.41 and followed the instructions but after changing the java file am not seeing the context menu changed. I tried changing the existing names also like i change the "New Window with HTTP" to just "New" but there is no change reflection in the software console. Did you try to force refresh the page? As the entry already seems to be there, it might be just a caching issue. When I try to Access the device via FTP for example, a new Windows pop up.